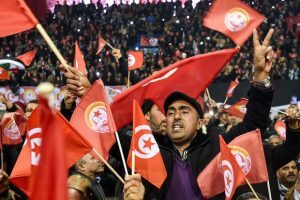 The Tunisian General Labor Union UGTT has been harshly criticized by Syrian opposition groups after leaders of the Union visited the Syrian President last month and called for normalization of Tunisian-Syrian ties. Late last month, a delegation of leaders of the Noble Prize winner UGTT met with Syrian embattled President Bashar al-Assad and expressed him support in the fight against terrorism. The visit sparked anger among Syrian figures opposed to Bashar al-Assad. The legal representative of the internationally recognized Syrian National Coalition for Revolutionary and Opposition Forces, Haitham al-Maleh, told Quds Press Agency, that they are compiling data and statements issued by the leaders of the Union who visited Bashar al-Assad at the end of last month and interrogate them before the International Confederation of Trade Unions and judicial institutions, Middle East Monitor (MEMO) reports. “We have reports from UN fact-finding committees, most of which confirm that Bashar al-Assad’s regime has committed war crimes against humanity and against his people. We have filed two cases before the International Criminal Court against Bashar al-Assad and several of his regime’s leaders on this basis,” said al-Maleh. “How can an Arab, whatever his affiliation is, accept to visit a president who killed his people with live ammunition, explosive barrels and chemical weapons, who brought the Russian and Iranian occupation to his country, and accepted long-term Russian military bases?” he questioned. The Revolution and Opposition Forces also indicated that the Union will be held accountable before the Syrian population and international community for its support for Bashar that they call criminal. Another high profile figure, Anwar al-Gharbi who heads the Council on International Relations and Development pointed out that the ‘controversial’ visit and endorsement for Bashar harms the Union, referring to the UGTT’s membership in the International Labor Organization and the International Confederation of Trade Unions. The UGTT has been opposed to international intervention in Syria and to Tunisian foreign fighters enrolled in the ranks of the Islamic State (IS). It is reported that that above 3,000 Tunisian fighters have been combatting in Syria and Iraq. Tunisia severed ties with Syria in 2012 following Bashar’s crackdown on opposition. A July move by the parliament to restore ties failed over lack of quorum required to validate the motion, Middle East Eye notes. Written by: KanelkaTagba on August 8, 2017. Posted by KanelkaTagba on Aug 8 2017. Filed under Headlines, World News. You can follow any responses to this entry through the RSS 2.0. Both comments and pings are currently closed.